From the Creator of Zorro comes a lost hero of the past- Johnston McCulley's The Man in Purple lives again in THE NEW ADVENTURES OF THE MAN IN PURPLE, now as a top quality audiobook produced by Radio Archives for Pro Se Productions! The Man in Purple is Richard Staegal, a wealthy man-about-town with a colorful past. Donning a purple mask and suit, Staegal leads a life of outrageous adventure stealing from the rich and ruthless and giving the spoils away to the powerless people who are unable to fight for themselves! From out of the past comes new tales of the Violet Vigilante! Featuring Exciting new stories of thrilling capers and fast moving adventure from Russ Anderson, Jr., Ashley Mangin, Lee Houston, Jr., and Terry Alexander! Join the Man in Purple as he takes on new adventures with his nemesis, the intrepid Detective Troman hot on his trail! Bar your windows and lock your doors, but if you're his target, nothing will stand in the way of the Man in Purple in his pursuit of Justice and Adventure! THE NEW ADVENTURES OF THE MAN IN PURPLE! This fantastic New Pulp audio book is also available on Audible and Itunes. 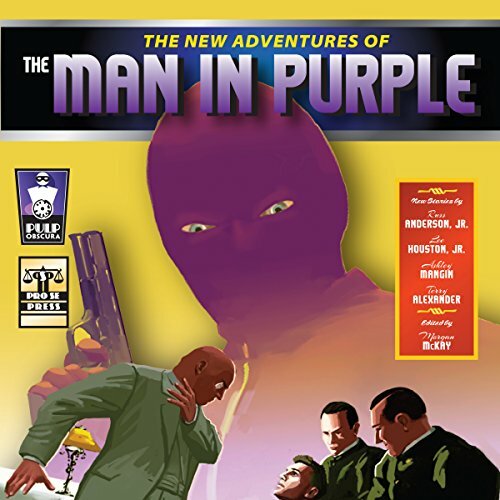 THE NEW ADVENTURES OF THE MAN IN PURPLE is available at Amazon and www.prose-press.com.